Circuit Benders’ Ball is Now a Franchise! CBB Columbus March 31st! A few weeks ago, Alison Colman of The Fuse Factory hackerspace in Columbus, Ohio approached me about bringing the Circuit Benders’ Ball to their fair city. As you may remember, The Circuit Benders’ Ball Nashville was a one day festival devoted to the art of circuit-bending. We put it on at Open Lot in October of 2010. Because Open Lot didn’t have a space in 2011, we skipped that year. I’m happy to announce CBB Nashville will be back this year! Details soon. The Columbus event is completely independent from the Nashville event. Everything about the show looks amazing. They have a Kickstarter page, and they’ve already met their $1500 goal. But that doesn’t mean the fundraising is over. Everything above $1500 will go toward more performers and workshops, so please contribute. 6 out of these 7 performers appeared on the Theatre Intangible episode E059 FauxBeAnt Art Fair, and that’s a great place to start learning about what to expect at CBB Columbus. Here’s the description of CBB Columbus from the Fuse Factory webpage. Road trip anyone? The Circuit Benders’ Ball Columbus is a one-day event that celebrates the gentle art of tearing apart your electronic toys and gadgets and reconfiguring them into a musical instrument or artwork – i.e. break it to make it. 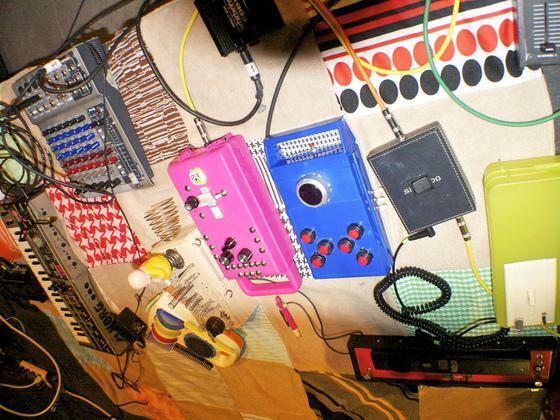 We have invited benders/hardware hackers/sound artists from Ohio and other parts of the mid-west to perform with their circuit bent instruments and lead workshops covering a range of topics pertaining to circuit bending. The workshops, which will take place in the afternoon, range from intro level to advanced and are open to all ages. In the evening, experimental musicians and sound artists will perform with circuit bent instruments, custom-made electronics, and/or battery-powered electronic devices; genres will range from ambient soundscapes to aleatoric noise to EDM influenced grooves. The all-day event will take place on March 31 2012 at the Columbus Idea Foundry (1160 Corrugated Way, Columbus OH 43202). Workshops will take place from 1pm – 4pm, and performances begin at 7pm (doors open 6pm). Workshop admission $10. Performance admission $10. Folks who preregister for a workshop and preorder tickets for the performance receive a $5 discount.